Heat oven to 375°F. Spray cookie sheet with cooking spray. In medium bowl, stir Bisquick mix and boiling water with spoon until dough forms. Divide dough into fourths. On surface sprinkled with Bisquick mix, roll dough in Bisquick mix to coat. Press each piece into 6-inch square, 1/4 inch thick. 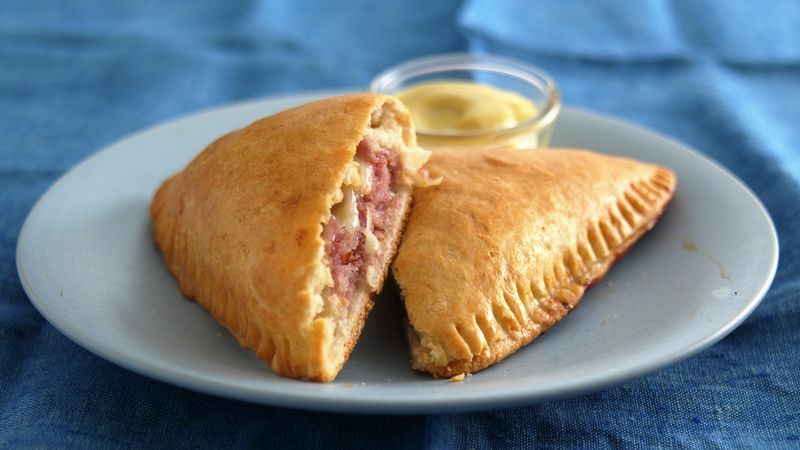 Spread 1/2 teaspoon of the mustard on each dough square to within 1/2 inch of edges. Top with ham and cheese to within 1/2 inch of edges. Fold each square diagonally in half. Press edges with fork to seal. Place on cookie sheet. In small bowl, beat egg and water. Brush over sandwiches. Bake 20 to 25 minutes or until crust is golden brown. Serve with a side of mustard for dipping. Try using peppered ham or other seasoned ham in place of the plain ham. Before baking, brush with beaten egg and sprinkle with caraway, poppy or sesame seed, or use a mixture of all three. To Freeze and Bake: Place unbaked sandwiches without egg wash on ungreased cookie sheet. Freeze uncovered 2 to 3 hours or until solid. Arrange in single layer in container to prevent breaking; seal well. Freeze up to 2 months. To bake, place on greased cookie sheet and brush with egg-water mixture. Bake at 350°F 25 to 30 minutes or until crust is golden brown.